Why Fred Goldman Must Be Smiling Now | Comics I Don't Understand - This site is now being updated daily at http://www.comicsidontunderstand.com. Please change your bookmark if necessary, and notify any web site with a link to the old address. I want to know why it was publisher-firing-ly horrible for OJ to write and sell a book about how he would have “theoretically” murdered his ex-wife and her lover. But now apparently it is perfectly OK for the parent of one of those victims to sell the *exact* *same* *book*. And I don’t buy the “but now OJ doesn’t get any of the money” argument. Steven: my first reaction was, “It’s not okay,” even though there’s the appearance of “poetic justice” (or turnabout is fair play) when the book winds up in Ron Goldman’s father’s possession. I haven’t considered all the ethical ramifications of this case, but my gut reaction is that this is far from okay. What if the money were given to charity? I’d say it’s STILL not okay. Dirty money is dirty money no matter who gets it. And this book — no matter who profits from it — is a transparently crass attempt to exploit the deaths of two people. But by the same token, you could say that virtually ALL true-crime books exploit the deaths of others for profit. And by extention, couldn’t you say that that members of the news media routinely profit from death? It’s a debatable point. This is a more complex issue than it initially appears, but again, my gut reaction to *THIS* particular instance is that it seems wrong for anyone — even Ron Goldman’s father — to profit from this book. My feeling is that Mr. Goldman just wants OJ to see that he did the work and he’s getting nothing. Of course, since he already got (and dispersed) a hefty advance and it was mostly ghost written, it isn’t much of a get even experience. Hopefully, at least some of the money will be used for the kids’ therapy. Steven, I find the “but now OJ doesn’t get any of the money” argument pretty compelling. 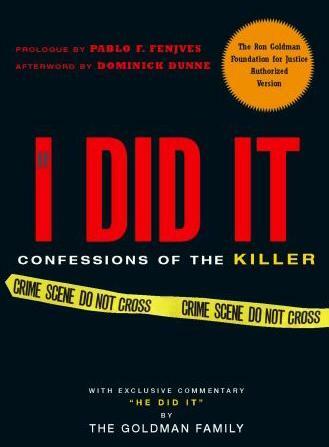 The problem before was that if you bought the book you were helping reward a murderer for committing that murder. Now if you buy the book, you’re helping compensate one of the victims’ family for that murder. That seem like a huge difference. Why is buying this book now any worse than buying Marcia Clark’s book about the trial? Not that I’m more inclined to read the thing. It seems pretty gross to me to want to delve into the details of a horrible double murder. Except, Autumn, that O.J. already received about $700,000 up-front, which he never had to return even after the book was canceled. If the book had made it to the stores last year, it would have been HarperCollins that profited the most, not O.J. Bill, I had not thought of that. I assume that if I buy the book now, HarperCollins will still profit? It does seem wrong to reward HarperCollins for their sorry role in all this. Autumn, the contract called for the rights to revert to Simpson after a year if the book went out of print (or was never published), so as of this fall Simpson would have the rights to sell it to anybody he chose and HarperCollins would be out of the picture (unless they negotiated a new deal with him of course). As a result of the court ruling, the rights will go to the Goldmans instead of to Simpson, and they get to make a fresh deal with whatever publisher might be interested. Well then I’m back to thinking that it’s OK to buy the book. But wait! I just did a google search, and now I see that the other family is opposed to the book. So now I don’t know again. Hmmm… Well, as I said before, I don’t want to read the book anyway. So let’s just say that it would be horribly immoral to read this book. Then I can claim a great moral victory for refusing to read it. The debate regarding the “book’s” potential profit making has been rendered moot with the leaking of the entire book online, prior to the rights being rewarded to Goldman. Seeing the writing on the wall in the fact they would lose the rights to Goldman, OJ (or his daughter) spitefully placed the transcript on the Internet to kill (pun intended) any profitability. Anyone who is truly desirous of reading what amounts to, what I call, “published diarrhea*”, can do so with a mere cursory search online at numerous websites where it is mirrored. *…I consider this “book” to fall in the category of the explosive kind. Autumn, Nicole Brown’s family remains opposed to the book because they weren’t part of the settlement: The Goldman family got the rights, not them. However they’ve indicated they’d have LIKED TO BE part of the settlement, which means that in their case, it’s not the principle of the thing, it’s the money. And Craig, I doubt sales will be hurt much by parts of the book being leaked online: The entire Starr Report was online, after all, yet it was still a big seller. Dammit, Bill, stop confusing me with even more facts! I’ve already decided. It’s wrong to buy the book, and I am virtuous for refusing to. End of story! I would agree with you, Bill, except there are two distinct differences with the Starr Report and “Confessions of a Double Murderer”. “Confessions of a Double Murderer” is available as a tiny pdf file, whereby it’s barely 236 pages are formatted as facing paired pages, resulting in a grand total of …118 pages. The book was obviously formatted in a way to simplify its portability and dissemination. The second is that the Starr Report, in some quarters, was considered a legitimate and fair accounting of the Clinton Administration. The court of public opinion is almost unanimous in the acrimony and disgust with the OJ “book”. Even if Goldman finds a reputable publisher, I think there is still a public perception that buying the “book” is tantamount to contributing to “blood money” profits. I think that if the “book” was ever published under Goldman, it would be a flop, but I guess we’ll have to wait and see. Craig, very few people cared much about all 500 pages of the Starr Report. There was every indictaion that KENNETH STARR didn’t care very much about all 500 pages of the Starr Report. Most people bought the book for the passages about the cigar, as well as the other naughty parts. Goldman attorney Paul Battista said TMZ’s posting of the manuscript on Tuesday violated that order and may do irreparable harm to the family’s attempt to benefit financially from it. “I can’t tell you how distraught the Goldmans are to hear that this hit the Internet for free,” Battista said. Brian Rich, attorney for the bankruptcy trustee, called the posting a “serious violation” of the order, asking the judge to haul TMZ executives into court to explain why the company shouldn’t be held in contempt and perhaps sanctioned. Based on how much traffic articles about O.J. are getting now (and last fall) and the fact that John Mark Karr was THE biggest news story of last August, I would say that both the O.J. case and the JonBenet case will be fascinating the public for many years to come. I don’t think it’s any less wrong for the Goldman’s to sell the book. It’s still capitalizing on murder. It seems to me that if the book sells well, Goldman will be under pressure to do something “ethical” or “right” with the money, or he’ll be painted as a greedy opportunist, too. I think his obsession with OJ has blinded him to that. The poor man is not going to get any eartly justice in this matter: OJ has had his day in court–and he won because the prosecution was so certain of victory that they bungled the case. When OJ first came out with the book, I thought (possibly naively) that the plan was for the book to become a bestseller and to generate the money needed to pay off the civil verdict to the browns and Goldmans. I thought at that time that the Goldmans & Browns would applaud the book which both hinted at a confession and would give them what they were entitled to (the latetr of which they may now never get). By killing the book, Goldman seemed to be cutting off his nose to spite his face. Now that Goldman has the rights and will be publishing, I wonder if any of the profit will count toward the civil verdict that OJ owes him (them). As I understand the ruling, Pinny, the Goldmans received the rights to the book IN LIEU OF what O.J. owed them — which seems like a pretty good deal, since O.J. clearly wasn’t ever going to pay them anything. Reading all of these comments would make one feel as if O.J. was found guilty in a criminal court of law. Yeah, imagine that. People might draw their own conclusions from the evidence. This is a side-topic, but one of the expert witnesses for the prosecution was a stats prof at my undergrad institution, and he gave a talk on the DNA matching math to my math club. And he used the data from the O.J. trial. Prof. Weir was pretty pissed about the whole thing, and also gave some advice about being an expert witness. Very interesting talk. Fred Goldman is WORSE then OJ is. He has become the greediest man in the USA right along with his glory seeking money hungry daughter, He needs to realize no amount of money is ever going to bring is son back. And even if he were to get all the money he was “unjustly” awarded, he would still want more as that would not satisfy his greed. Just how much does he think his son’s life is worth?? None of the troops families who where killed in IRAQ will ever get this amount of money for their loved ones. Why is his son’s life worth more then anyone else’s? How is Fred Goldman such a bad man? He doesn’t care about the money as he does about sticking it to OJ. The twisted verdict in the murder trial left his family in a tormented, painful state. The lack of justice was appalling. Can anyone blame him for trying to get any kind of justice that he can grab hold of on his own? I do not. How exactly was the murder verdict “twisted”?